As its name suggests, this exotic pest only attacks mountain ash. 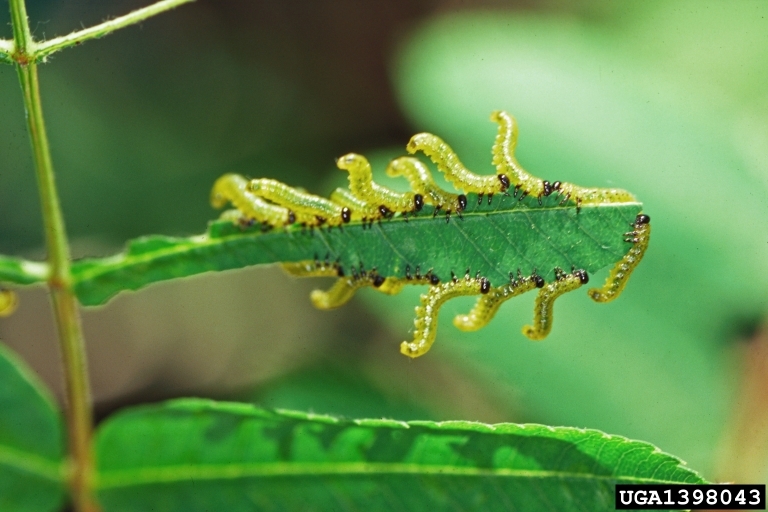 However, its larvae can cause rapid, severe defoliation that nonetheless rarely kills the host. The insects can produce two generations per year. The larvae, which change colour as they grow (initially pale yellow, later turning to yellow with black flecks), feed on the margins of leaves, which they later completely devour, except for the central veins. The young larvae are gregarious initially, but as they grow, they disperse throughout the tree crown. The damage they cause is concentrated in the summit of the crown, then spreads to the lower branches where it is usually more severe. The mountain ash, a common species in rural areas, is often grown as an ornamental tree because of its foliage, abundant fruit, and relatively small size. The mountain-ash sawfly has two generations per year in the south of the country, but only one in the north. It overwinters in a cocoon in the soil. Adukts emerge from the end of May to the first fays of July. The second generation, when there is one, starts at tne end of July. It is usually small. The mountain ash sawfly originated in Europe and was first reported in North America in 1926 in New York State. The insects spread rapidly and are now found in vast areas of the northeastern United States and eastern Canada. In Ontario, it was observed for the first time in 1938. 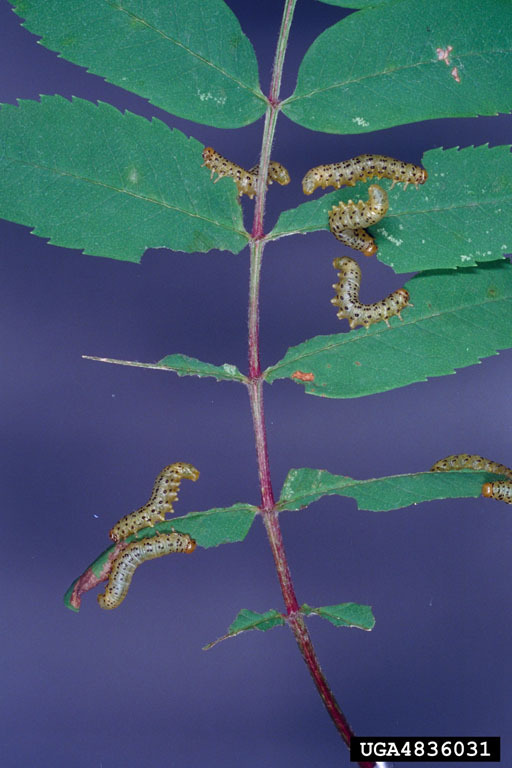 Mountain ash sawflies have a few natural enemies that limit their range. Their populations also fluctuate according to climate variations. 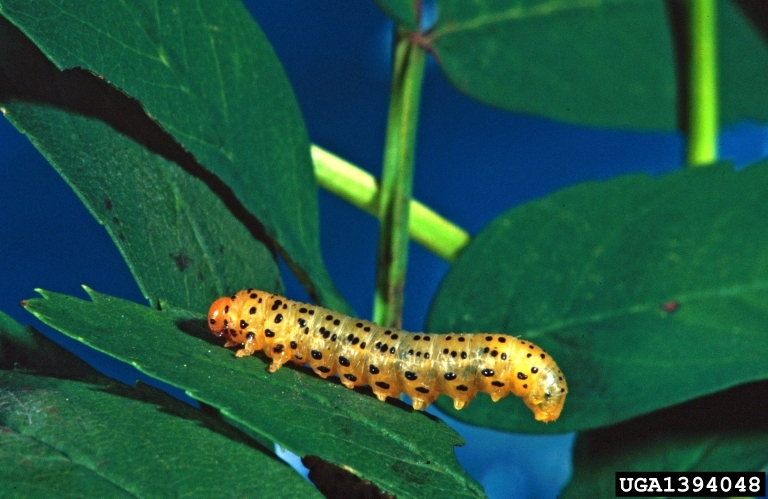 Damage caused by the insects can usually be limited by removing and destroying branches and leaves on which the young larvae have been present. The biological control of this insect by an introduced parasitoid is a success in this area of insect control. Forbes, R.S. et Daviault, L.1964. The biology of the Mountain Ash sawfly, Pristiphora geniculata (Htg.) (Hymenoptera: Tenthredinidae), in Eastern Canada. Can. Ent. 98: 1117-1133. Hiratsuka, Y., Langor, D.W. and Crane, P.E. 2004. A Field Guide to Forest Insects and Diseases of the Prairies Provinces, 2nd Ed. Natural Resources Canada, Canadian Forest Service, Northern Forestry Centre, Edmonton, Alberta, Spec. Rep 3, 297 pp. Quednau, F.W. 1990. Introduction, permanent establishment, and dispersal in Eastern Canada of Olesicampe geniculatae Quednau and Lim (Hymenoptera: Ichneumonidae), an important biological control agent of the mountain ash sawfly, Pristiphora geniculata (Hartig) (Hymenopttera: Tenthredinidae). The Canadian Entomologist 122: 921-934. Smith, G.K.M. 1996. 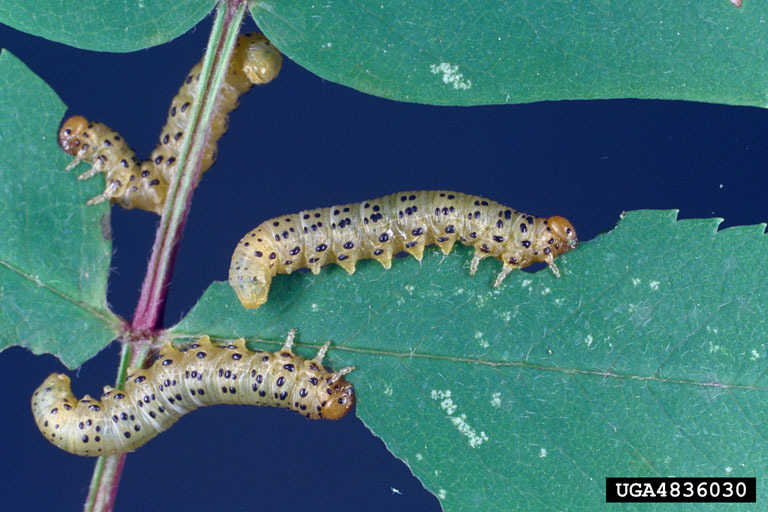 Insect parasites control three introduced sawflies. Natural Resources Canada, Canadian Forest Service, Great Lakes Forestry Centre, Frontline Technical Note 24, 4 pp. West, R.J., Dixon, P.L., Quednau, F.W., Lim, K.P. and Hiscock, K. 1994. Establishment of Olesicampe geniculatae Quednau and Lim (Hymenoptera: Ichneumonidae) to control the mountain ash sawfly, Pristiphora geniculata (Hartig) (Hymenopttera: Tenthredinidae) in Newfoundland. The Canadian Entomologist 126: 7-11.